This is just adorable, Lynn. I was looking to buy that MB die but I hadn't see it in person. I really like it and will add it to my "buy soon" list. Are you saying Rambo is a bit rambunctious? I don't believe it. LOL Enjoy today and your weekend. Hi Lynn, I do so love this little pooch he sure does look like he is off to the ball. Fabulous card as always. 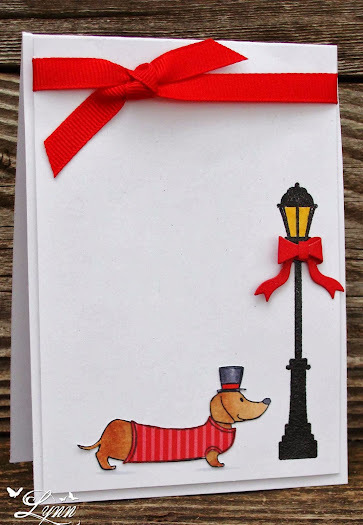 You already knew I was going to love this card with that cute doxie :) I love his top hat and especially love the way you added the bow to the lamp post! CA-UTE!! Adorable card, just love the cute image and the shining light! Rambo is dapper enough, he doesn't need a top hat! Very nice! Looks just like Rambo! And I see you were at the same sale I was, ROFL!!! Happy 2014. You are wrong Lynn - that IS Rambo - it's his alter ego!! BAHAHA! I suppose not many images come with dogs doing their usual thing ;) lol! Giggling at the thought, though...hat laying chewed and tossed aside, leg lifted....lol! I love that bow on the lamp post, and this card totally says New Years to me :) Fabulous! It is sooooo good to be able to chuckle so early in the moring! Hehehe So darling! Love the doxie and the scene you create you always put a smile on my face! Ha ha! Love this cute card and the matching red bows. The little dog looks so cosy in his little jumper! Adorable card, I love that sweet image and fabulous lamppost! Maybe Rambo is turning over a new leaf for the New Year? Naaaaah. lol Darling card, Lynn, even if it isn't "Rambo in Red." Happy New Year. hahahah... don't know what is funnier - that cute card or the Rambo comments! Fab card though Lynn and you already know how much I love your CAS style. Too cute! Would Rambo keep the coat on either? I love all the reds and the doggy is adorable! You could put a heart in his mouth and call it a Valentine! Oh, I love your doggy cards! This one is especially festive! LOL at not being Rambo. Maybe it's him using his secret identity, very James Bond of him!